The game's official launch trailer is now out in advance of next week's release. 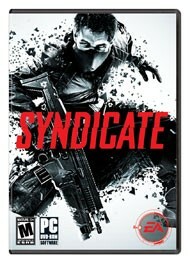 The demo for Syndicate recently became available for Xbox Live, and Game Informer sat down to play a few rounds online. The latest trailer for the upcoming Syndicate from Starbreeze Studios shows off cooperative gameplay. In the future, people will see through walls. And what they see will be orange. You've seen videos detailing Syndicate's co-op gameplay, breaching mechanics, and corporation-dominated sci-fi setting. Now it's time to check out the arsenal. co-op chops suggests it might have a fighting chance. This trailer gives some hope for the new Syndicate's four-player co-op sci-fi shooter action. Syndicate executive producer Jeff Gamon shows off what Miles Kilo's DART 6 chip can do in this extensive walkthrough of an early level in the game. The future is a dangerous...and lucrative place. Check out Syndicate in this official trailer for the game. The long-standing rumors were true, EA and developer Starbreeze Studios are teaming up to bring you a new Syndicate.